A false-color image of Neptune taken with NASA's Voyager 2 probe, the only spacecraft to fly by the distant planet. A new study relies on professional and amateur astronomers' images of the planet to track its weather patterns. Professional astronomers aren't the only ones who can explore the outer planets and contribute observations to space science; amateurs can take part, too. 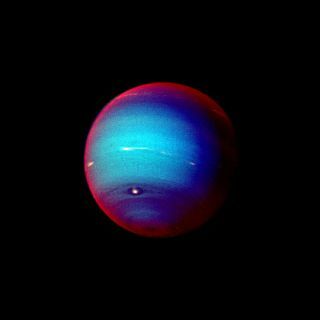 In fact, five amateur astronomers co-authored a recent study of Neptune. In the research, they tracked bright spots, probably storm systems, on the planet, and showed how these spots move in Neptune's atmosphere. Tracking the storms allowed professional astronomers to map wind speeds for different latitudes and study the differences between the movement of the bright storms and the dark spots, which are probably whirling patches of higher pressure called anticyclones, in Neptune's atmosphere, according to the study. So Hueso's group turned to the amateur community. Anyone with a sufficiently large telescope can image Neptune and get some surface detail. An international group of amateur astronomers tracked the bright spots on Neptune from July to December 2015. Some of those amateurs contributed images to the study. "There are still many unknowns about the weather systems on these planets, and any good images are of interest to the professionals as they can't get enough time on their large telescopes to take the repeated images needed to track and understand how the weather works on these other worlds," Anthony Wesley, an amateur from Murrumbateman, Australia, and one of the five amateur co-authors on the study, told Space.com. Wesley, a computer programmer by trade, has made contributions to planetary astronomy in the past, discovering impact events on Jupiter in 2009 and 2010 using a 14.5 inch telescope. Using the data gathered by the amateurs , planetary scientists found that a bright storm moved back and forth from east to west, covering about 16 degrees of longitude, over about three months. The movement is similar to that of the dark spots on Neptune and the Great Red Spot on Jupiter. The drift rate of the storm system also showed that the wind in the southern latitudes of Neptune was still moving at about 194 mph (312 km/h) — nearly the same speed as when the spacecraft Voyager 2 flew by the distant planetin 1989. The five amateur co-authors were from several countries — the U.S., the Netherlands, Australia and France. They used medium-size telescopes; the largest had about 14-inch apertures. The first amateur observations in conjunction with professionals of bright spots on Neptune's southern hemisphere were taken in September 2013, by Peter Gorczynski, of Oxford, Connecticut, using a 14-inch telescope. Others followed, and showed for the first time that amateurs working with relatively small telescopes – none had more than a 16-inch aperture -- could study the ice giant consistently. However, the data covered only a monthlong period from August to September. A year later, amateurs once again joined professionals in tracking bright spots, but again it was only from September to October 2014. Finally, in 2015, Hueso, using a 2.2-meter (7.2 feet) telescope at the Calar Alto Observatory in Spain, saw bright spots again, and called on amateurs to help him track them. This time, 20 amateur astronomers took about 50 total observations, Hueso said. "My friend Willem Kivits and myself received the call of Ricardo Hueso for amateurs to try to detect a bright storm on Neptune," Sussenbach told Space.com. "A week after Ricardo's discovery, I was able to detect the storm. Willem and I have followed the storm for almost half a year." Kivits, who died last February, also got a co-author credit on the paper. Sussenbach credits the development of cheaper digital cameras with allowing amateurs to collaborate with professionals in this way. There are "quite a number of amateurs around who have telescopes with more than average caliber nowadays, with very sensitive, relatively cheap cameras," he said. "It's possible to make higher-resolution images, and that really is a big step forward." One contribution from the amateurs was that it enabled the professionals to predict when the spot might be visible again, Sussenbach said. "With the confirmation that the spot could be detected by amateurs, [professional astronomers] could rapidly provide predictions when the spot would be visible again," Sussenbach said. The data was used to calculate the drift of the storm, which, in turn, will help astronomers understand Neptune's atmospheric dynamics. Sussenbach used a webcam that takes video, as opposed to a high-end digital single-lens reflex (DSLR) camera, even though most webcams have lower resolution than DSLRs. That's because DSLRs don't take as many images per second, he said. There may be only a fraction of a second when the air is clear enough for a useful picture, so taking many frames per second is preferable to one every few seconds, he said. "It was really a collaboration," Sussenbach said. "That was exciting, that people take you seriously." The study appeared online in the journal Icarus on June 5. Follow Jesse Emspak on Twitter @Mad_Science_Guy. You can follow us @Spacedotcom and on Facebook & Google+. Original story on Space.com.